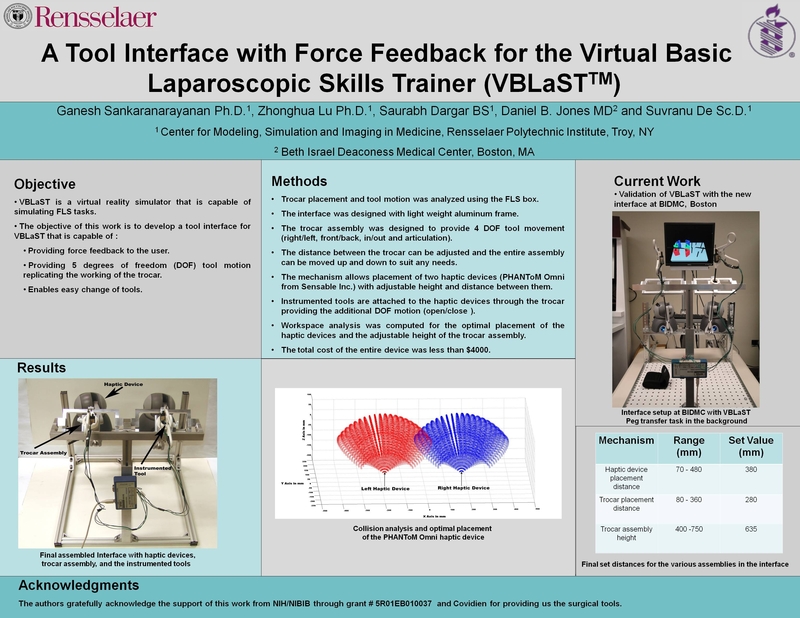 OBJECTIVE: The objective of this research was to develop a tool interface that is capable of providing force feedback for the Virtual Basic Laparoscopic Skills Trainer (VBLaST), a virtual version of the Fundamentals of Laparoscopic Surgery (FLS). DESCRIPTION OF METHODS : The FLS tasks are performed bimanually with the tools inserted through the trocars. The trocars act as a pivot through which the tools are manipulated with 5 degrees of freedom. The tool interface was built to replicate this setup. It consists of a height adjustable frame attached to a base platform all made of light weight aluminum. On top of the height adjustable frame, two trocars can be attached to the passive joint mechanisms, designed to replicate the functions of the trocar. The distance between the trocars can also be adjusted to match the FLS trocar placement measurements. Real surgical tools instrumented to sense the opening and closing of the tip are inserted through trocars for interaction. Two PHANToM Omni haptic devices from Sensable Inc. placed on the base platform to which the tip of the tools are attached using a quick release mechanism, sense the motion of the tool tip and provides haptic feedback. The quick release mechanism allows for easy change of tools such as the grasper, shear, needle driver etc. RESULTS: A workspace analysis was performed to find the optimum placement of the two haptic devices to minimize collisions of the articulated links of the haptic device mechanisms. The final placement distance between the two haptic devices was set at 380 mm. The distance between the two trocars which can be adjusted by moving the trocar placement mechanism in the range of 80 mm to 360 mm were set at 280 mm. The adjustable height of the trocar assembly frame which can be changed from a minimum height of 400 mm to a maximum of 750 mm was set at 635 mm. The device workspace was also calibrated with the VBLaST to provide similar movements to the FLS. Clinical studies are currently being undertaken at the Beth Israel Deaconess Medical Center, Boston to test the effectiveness of the new interface. CONCLUSION: A novel tool interface with force feedback capabilities was presented for the VBLaST. Workspace analysis confirmed its operation similar to the FLS trainer box.